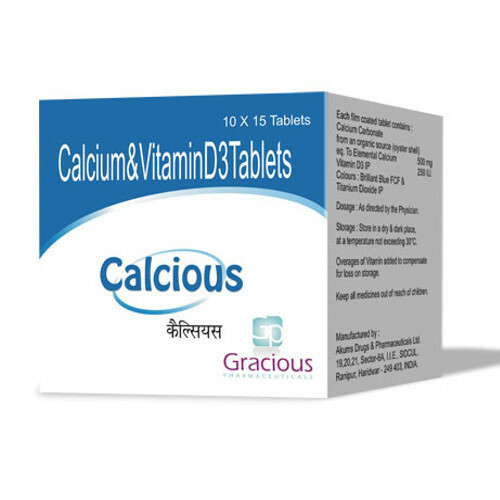 Calcarbonate Plus Vit D3 is a calcium supplement that is used in deficiency states and as an adjunct in the prevention and treatment of osteoporosis. Vitamin D3 is a fat-soluble sterol, it aids in the regulation of calcium and phosphate homeostasis and bone mineralisation. Pay Mode Terms: "T/T (Bank Transfer), Western Union, L/C ,Wire transfer, Pay pal. Minimum Order "Quantity: "500 Tablets. Packaging Details: Quality bubble packing in corrugated"box for Exports. We are only deal in overseas market "So Queries from Foreign countries only". Established in the year 2011, we "SRM Traders" are the leading Exporter and Dropshipper of quality approved assortment of ED Medicines (Sildenafil, Tadalafil, Verdenafil), Modafnil, Armodafinil, Tramadol, Anti Cancer, Anti HIV, Infertility Medicine, Weight Loss Medicine, Antifungal Medicine, etc. The products offered by us are used for the treatment of various diseases and are known for providing immediate and long lasting relief. In addition to this, these are completely safe and do not have any side effects. We are backed by a huge vendor base that has modern infrastructure facility which supports to prepare optimum quality products for our customers. Well-resourced with advanced equipment, our vendor’s infrastructural facility is properly segregated into enormous sections for hassle production process. These divided parts are controlled by the adroit team of professionals to enhance the productivity.